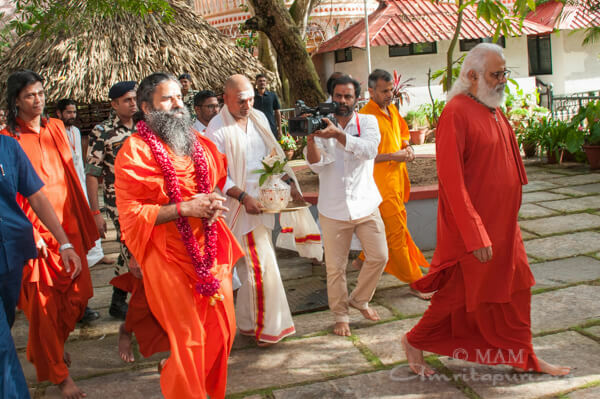 Yoga Guru Baba Ramdev came to Amritapuri to meet Amma on Monday. It was the first time the two had met. 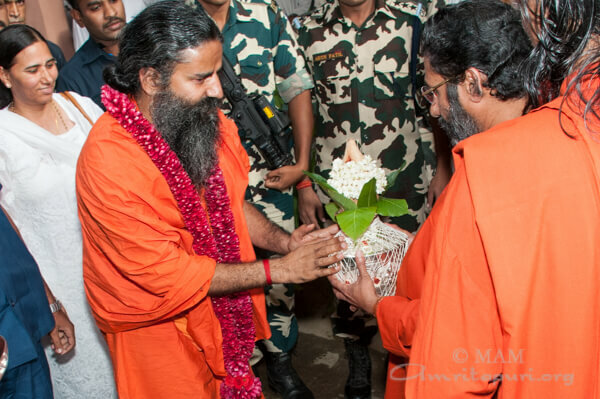 He was welcomed with Purnakumbam by the Swamis and was garlanded by Swami Purnamritananda Puri, General Secretary of the Mata Amritanandamayi Math. He met privately with Amma, engaging in a wide-ranging discussion touching on Ayurveda research, organic farming, protection of cows, education and yoga, and how to take it forward for a better India. 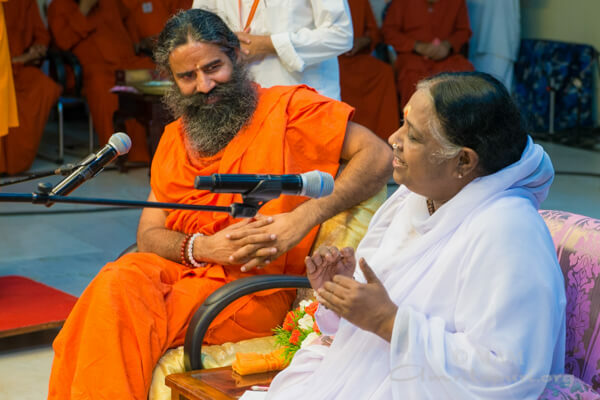 Later, Amma and Baba Ramdev addressed all the devotees together on the stage. Baba Ramdev spoke to the ashram residents and students of Amrita University about yoga and its health benefits, giving some amazing pranayama and yoga demonstrations. 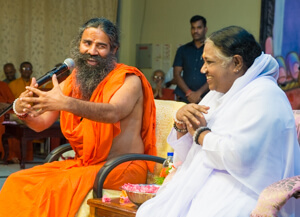 Addressing the assembled crowd, Baba Ramdev said, “I have come here for first time for Amma’s darshan. The Divine Mother’s presence, touch, compassion and action – all these I just experienced here in the last few moments. I have heard a lot about Amma. All know that she is very compassionate, doing a great deal of charity projects in education, the medical field and many other areas. But having come here, I see that both Amma’s spiritual knowledge and practical knowledge are extremely advanced. Amma was speaking to me about biochemistry, vitamin B, vitamin D, about the nature of cancer and potential avenues for treating cancer. This was a big surprise for me. Amma also shared her thoughts on current environmental issues. “I have learned in Gurukula that Brahman has two aspects, one is with form and one is formless. Amma is the embodiment of that Vedic knowledge. I understand that Amma has not learned in a Gurukula, yet what Amma lives is Vedanta. “In life, three values are important. Oneness, co-existence and brotherhood–which is love and compassion. Amma is living all these, so she is the embodiment of Dharma and Vedanta. “Amma told me today that Creator and Creation are not different. The Creation is the manifestation of the Creator. This is Advaita and it is the oneness that Amma lives. Amma loves and serves all, seeing all as divine. If you want to know what a Self-realised Rishi/Rishika of the Vedas would be — they would be like Amma. I came to know this today. Amma is the embodiment of spirituality. If you live like Amma does, this is the ultimate spirituality. “I studied in a Gurukula of Maharshi Dayananda. Because of that, my orientation is more toward the intellect. I have heard Amma loves all very much. True though. Earlier, hearing this I said, ‘My mother also loves me.’ What is the difference? But Amma’s love is like the love of God. In Amma, one can see the knowledge at its peak, bhakti at its peak, and karma at its peak. The Triveni Sangam (joining of 3 rivers) is there in Amma. I am not praising her. In the last few minutes what I have experienced, that is what I am sharing with you. “Amma is my greatest inspiration and ultimate ideal. Mother is not a person but she is the embodiment – Moortha roop of Jagadamba – of the Divine Mother. The Divine Mother’s infinite love, compassion and divinity – that Amma showers upon us as Amrit — that is why her name is Amritanandamayi Ma. “Nowadays, a lot of complaints are being raised against saints. But the true Rishis of Bharat and our parampara (lineage) are like Amma. This Rishi samskriti (culture), crores [tens of millions] of years old, will never perish. 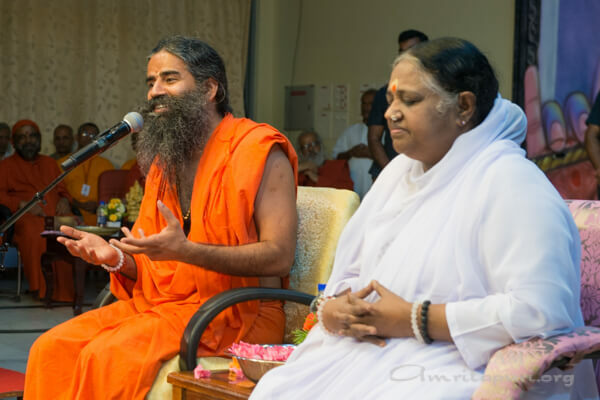 Whatever I am doing and Amma is doing is for raising the dignity of the Guru Parampara. There is no question of losing this culture. We will take it to the heights, making India the Jagatguru of the world. “Bharat Mata is not just a piece of land. This earth is our mother. In the land of India, a great many pious Mahatmas have taken birth. That is more respect has been given to Bharat Mata from the beginning of creation. 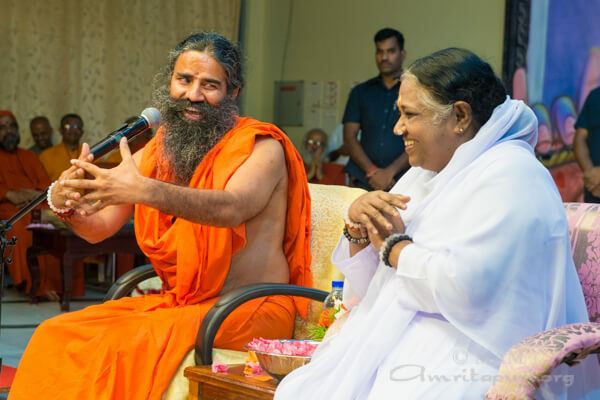 I asked Amma, ‘How are you carrying out all these great service activities?’ She replied, ‘My children are very good.’ If any mother is very proud of her children, she will be very happy. You all have made Amma proud. So, you are all divine children. May the Divine give children to all mothers in the world like Amma got these good children. “We need to do two things to become good children of Amma. One is honesty and the second is selflessness. When purity is there in your life, and divinity in your action, then in your life bhakti, yoga and karma all come together. “We can call our selves Amma’s children or devotees only when we ourselves become like Amma. True devotions means to we become what we love. 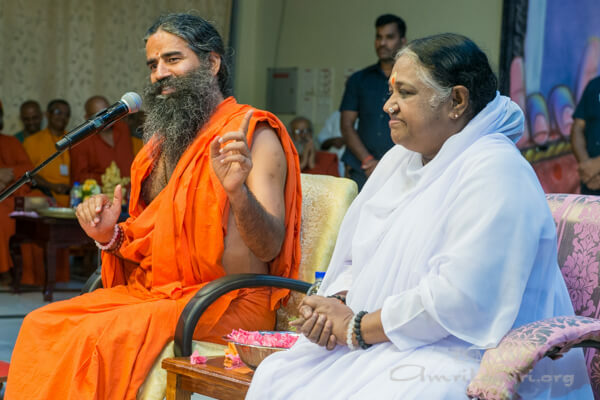 “In love, in bhakti, one has to become like Bhagavan – to become like Amma. This is bhakti, this is Shraddha, and this is action with love. This is disciplehood. May the divine bless us that we may become like Amma. “This body of ours is a temple ‘devalay’, a house of God. Be healthy, be happy. You have to take care of the body, do not make it ‘rogalay’ – a house of disease. For this, I will tell you some sutras. So I will speak something about health.” So saying, Baba Ramdev demonstrated some yogasanas and pranayama for the assembled crowd. He continued, “There is yoga in all – karma yoga, bhakti yoga, jnana yoga, raja yoga. ‘Be a yogi,’ says Sri Krishna in the Gita. A spiritual being, even though he may be a descendant of a Rishi — even then to bring spiritual awakening in the society, one will have to do Karma Yoga. Amma is setting an example in this regard, and I congratulate her for that. “Amma talks little but lives fully the dharma and truth. The problem today is that people talk a lot but don’t act at all. This is a big problem. “The whole world is my Mother’s family – vasudhaivaka kutambakam. All are here (in Amritapuri Ashram). There are no boundaries of language, religion, caste, or nationality. Here, there is only oneness. Look at the human body. The five elements are the same in every human body and throughout the body – the organs of action and perception are all made by these five elements. Our Atma (Self) is also one and the same within each of us. The Supreme is also one. Then where is the difference? Therefore, unity alone is the ultimate truth. If you are not able to experience this unity, you are either an idiot or you are blind. And yet Amma has given vision to the blind and intelligence to the idiot. 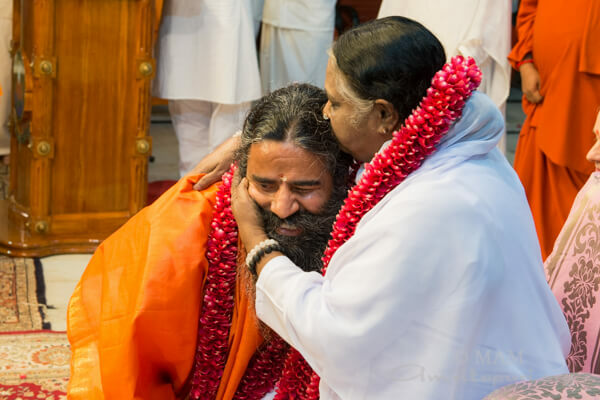 Here in Amritapuri, Amma’s school is not about awarding degrees but awarding divinity. From what I understand, Amma has not got any degree. She is divinity itself. Divinity one will not get from outside–it comes from within. In Amma’s form that divinity has incarnated. This is the greatest philosophy of Indian culture. 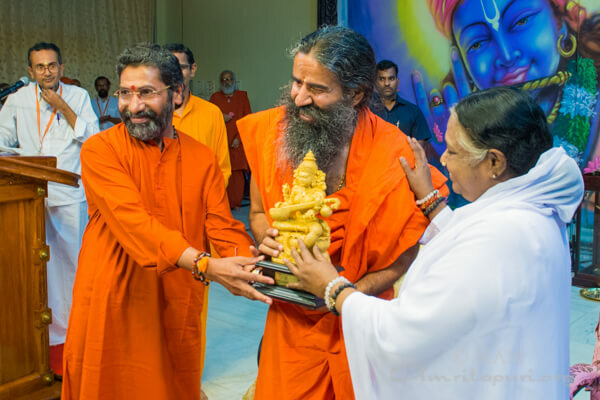 In conclusion, Baba Ramdev said, “Since Amma loves bhajans so much, I would like to sing a few lines.” So saying, he led the crowd in a call-and-response bhajan. 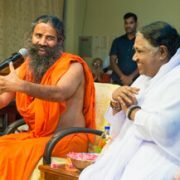 Before he took leave, Baba Ramdev visited the Kalari, Amma’s birth house and also met Amma’s birth mother, Damayanti Amma. He also visited Amrita University’s Amritapuri campus and interacted with the staff of the University.